We have an early nominee for the NFL’s worst penalty call of the year, just two weeks into the season. It took place during the final minute of today’s bout between the Baltimore Ravens and the Cleveland Browns. The latter team had squandered a 20-2 lead, now losing 25-20. However, Cleveland was driving and quarterback Josh McCown had just hit Terrelle Pryor for a huge reception in the red zone. All of the sudden, flags rained down and confusion spread like wildfire. Defensive holding was called on the Ravens, but it was offset by a taunting penalty on Pryor. As soon as you saw the replay, though, the latter call was deemed laughable. Pryor casually dropped the ball and headed towards the huddle. It’s something which happens numerous times in every game. However, the ball landed on a Baltimore player, taunting was called and Pryor was ejected. The offsetting penalties knocked Cleveland back out of the red zone, and McCown threw a backbreaking pick on the very next play. There’s no denying the fact the pathetic excuse of a taunting call literally cost the Browns a chance to win the game. You cannot make an argument otherwise. The idea that what Pryor did was any sort of flag-worthy play is nothing short of ridiculous. With all that said, harping on this one moment erases an aforementioned note about the game. 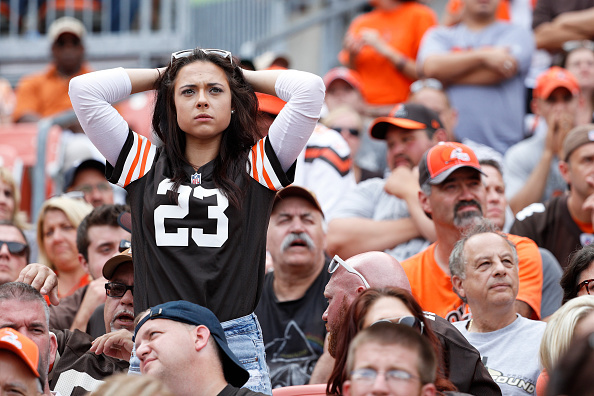 The Browns were up 20-2, and in the final minute of the game they were trying to overcome a 25-20 deficit. To clarify, Cleveland was up 18 just over four minutes into the game, and then failed to score a single point afterwards. Complain about the call on Pryor all you want – and, seriously, you have every right to – but you can’t deny the game should’ve never come down to it in the first place. If the Browns put up a few more points, they aren’t scrapping together a last second drive in attempts to win a game. If Cleveland’s defense doesn’t let up, the team doesn’t have to find an answer for giving up 25 straight points. To be frank, if the team didn’t emphatically yank its foot off the pedal once it grabbed a sizable lead, maybe we don’t come down to the egregious call on Pryor determining the fate of the game. The Browns were humming to start this contest. McCown seemed to light a fire under an offense which looked dormant last week. Isaiah Crowell tore off a monster touchdown run just minutes into the game. Corey Coleman showed why the team invested its first overall draft pick on him this past spring with an outstanding performance. The defense had Ravens QB Joe Flacco erratic and shaky. These were all huge steps in the right direction for a team which looked listless in its season opener last Sunday. And they were all crammed into one four minute span of the first quarter. After that, Cleveland just stopped. The offense turtled, the defense got caught in the muck. Slowly but surely, Baltimore crept back into the game. The Browns watched their lead shrink and didn’t do too much to try and stop it. So, no, there’s no denying the NFL should be embarrassed by the call which ended up determining the outcome of the game. One would hope the league at the very least reviews such a pathetic excuse for a penalty simply because of how much impact it caused on the final result. Again, though, it might not have even been a factor if Cleveland didn’t completely stall on both sides of the ball. We might not be talking about a taunting call if the Browns hadn’t blown a huge lead and erased the first signs of positive football they’ve shown in a long time. The ref’s gaffe wouldn’t have made a difference had Cleveland scored a single point past the four minute mark of the first quarter. At the end of the day, if you don’t want a vehemently bad call to be the difference in whether you win or lose, you have to play better. The Browns didn’t, and should spend the next few days wondering not about whether or not the flag should’ve been thrown, but why they were even in the position to be affected by it in the first place. Is There Already Dissension Within the Cleveland Browns Front Office?